This year, ‘In The Raw’ will feature breathtakingly beautiful acoustic arrangements of their own personal favourites from such artistes as… James Taylor, Simon & Garfunkel, 10cc, Michael Jackson, Billy Joel, Eagles, Pink Floyd, Toto, Bee Gee’sand many more in a brand new show for 2019. Following the massive success of their critically acclaimed studio and ‘LIVE’ acoustic albums, ‘Talon – The Acoustic Collection’ is back. If you have not seen this showbefore then you are in for a real treat. 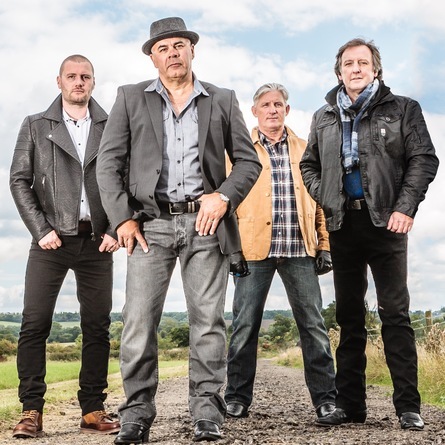 Sat on bar stools and armed with no more than their trademark four part vocal harmony, acoustic instruments and laid back banter, Jonny, Chris, Peter and Keith will leave you simply spellbound.